Blu-ray revenue and market share posted a small recovery off of last week's lows thanks to the release of Hotel Transylvania 3. It was easily the best selling Blu-ray for the week, ahead of another new release, Skyscraper. The next new release was the Blu-ray (and 4K Ultra HD Blu-ray) exclusive Constantine: City of Demons in 7th place. Hotel Artemis rounded off the new releases in the top 20 in 13th place. This week's Ultra HD Blu-ray report: Interestingly, all four of the previously mentioned new releases were made available on UHD. 9 titles out of this week's top 10 had UHD editions. BD sales share for a title is the percentage of disc packages sold for this movie that contained the Blu-ray edition of the film (including combos, and Ultra HD editions). So a BD sales share of 60% indicates that 60% of disc packages sold for this particular film contained the Blu-ray edition for this film, and so anything over 50% means that the Blu-ray version of the film was more popular than the DVD version. Out of this week's previously mentioned new releases, 'Hotel Transylvania 3' had the best BD sales share, with 53.49%. It was just slightly ahead of 'Hotel Artemis' with 52.17%. It's rare, but it does happen, and we have a new 3D release in the form of 'Skyscraper'. Unfortunately it also showed why studios are staying away from 3D releases, because it only got a 3DBD sales share of 0.93%. For the UHD releases, 'Hotel Artemis' had a UHD sales share of 16.99%, 'Skyscraper' and 'Constantine: City of Demons' both got 8.9%, and 'Hotel Transylvania 3' managed 3.33%. The stats for the week ending October 14, 2017 are as follows. Some small adjustments to the data posted last year (based on more recent updates) has been made and is shown below. Blu-ray sales increased by $3.07m (up 12.2%), with unit sales up 5.3%. DVD sales decreased by $3.97m (down 9.5%), with unit sales down 10.8%. This meant $0.9 million less in combined revenue for the week. Blu-ray's market share increased from 37.59% to 42.75%. Another A-list release helped Blu-ray revenue rise above $30 million for the week. That A-list release was Ant-Man and The Wasp, which outsold last week's number 1, 'Hotel Transylvania 3', by almost a 5-to-1 margin. Amazingly (or not), it was the only new release in the top 10, with the only other new release in the top 20 being the 20th Anniversary 4K Ultra HD exclusive release of The Big Lebowski (available as a standard 4K release as well as a limited edition 4K pack). There were two more new releases that made the combined Blu-ray and DVD top 20, but not the Blu-ray only chart. These were Warning Shot and Reprisal in 14th and 15th respectively. 'Ant-Man and The Wasp' did well on Blu-ray with the BD sales share of 69.66%. 'Warning Shot' managed 26% while 'Reprisal' got 10%. For the UHD releases, 'Ant-Man and The Wasp' did well too on UHD, with a UHD sales share of 16.54%. 'The Big Lebowski' was a UHD only release, so technically its UHD sales share would be 100%. The stats for the week ending October 21, 2017 are as follows. Some small adjustments to the data posted last year (based on more recent updates) has been made and is shown below. Blu-ray sales decreased by $2.39m (down 7%), with unit sales down 7.3%. DVD sales decreased by $6.38m (down 14.6%), with unit sales down 15.4%. This meant $8.77 million less in combined revenue for the week. Blu-ray's market share increased from 43.83% to 45.94%. A popular sequel was this week's top selling new release, with Mamma Mia! Here We Go Again topping both the DVD and Blu-ray charts. It was popular enough that the 2-movie pack featuring both movies also managed to snag itself a top 10 finish, with Mamma Mia! 2-Movie Collection in 9th. Three more new releases were available outside the top 10, but in the top 20. Scorpion King: Book of Souls, the Blu-ray only release Maximum Overdrive and Sorry to Bother You rounded off the top 20 in 15th, 16th and 17th respectively. This week's Ultra HD Blu-ray report: Of this week's new releases, only 'Mamma Mia! Here We Go Again' was made available on UHD (the 2 movie pack was not available in 4K). 8 titles out of this week's top 10 had UHD editions. It was actually 'Sorry to Bother You' that had the best BD sales share, with 70.96%. It was easily ahead of 'Mamma Mia! Here We Go Again', which got 55.56%. The 'Mamma Mia! 2-Movie Collection' also sold more on Blu-ray than on DVD, with 51.15%. 'Scorpion King: Book of Souls' got 40.20% while 'Maximum Overdrive' was not on the chart as it was a Blu-ray only release (so technically, 100% BD sales share). For the week's sole UHD release in the top 20, 'Mamma Mia! Here We Go Again' had a UHD sales share of 4.40%. The stats for the week ending October 28, 2017 are as follows. Some small adjustments to the data posted last year (based on more recent updates) has been made and is shown below. An "all red" week narrowly avoided thanks to rising weekly Blu-ray market share, but with all other indicators declining. I guess 'Mamma Mia! Here We Go Again' was no match for 'War for the Planet of the Apes' and 'The Emoji Movie', both released in the same week last year. Blu-ray sales decreased by $3.56m (down 12.9%), with unit sales down 11.2%. DVD sales decreased by $10.96m (down 24.6%), with unit sales down 21.3%. This meant $14.52 million less in combined revenue for the week. Blu-ray's market share increased from 38.26% to 41.72%. Blu-ray revenue recovered slightly from last week thanks to the Blu-ray exclusive release of Batman: The Complete Animated Series - Deluxe Limited Edition. It was the best selling new release Blu-ray, but it still only managed a 4th place finish on the Blu-ray chart. In 6th place was the next new release, The Spy Who Dumped Me, and Teen Titans Go! to the Movies rounded off the top 10 with a 9th place finish. Outside of the top 10, Mandy came closest at 11th, while The Darkest Minds managed a 13th place finish. Slender Man finished in 16th. And the surprising run of 'Hocus Pocus' on Blu-ray continues, with a high 3rd place finish this week! This week's Ultra HD Blu-ray report: Of the previously mentioned new releases, both 'The Spy Who Dumped Me', 'The Darkest Minds' has UHD editions. 7 titles out of this week's top 10 had UHD editions. You might be surprised to find that out of this week's new releases, 'Teen Titans Go! to the Movies' actually had the best BD sales share, with 63.37%. It was just ahead of 'Mandy' at 55.81%, with 'The Darkest Minds' getting 51.31%. 'The Spy Who Dumped Me' just failed to get above 50% at 49.63%. The two UHD releases in the top 20, 'The Spy Who Dumped Me' and 'The Darkest Minds', managed to get 6.55% and 6.49% respectively. The stats for the week ending November 4, 2017 are as follows. Some small adjustments to the data posted last year (based on more recent updates) has been made and is shown below. Blu-ray sales increased by $3.75m (up 15.7%), with unit sales up 9.3%. DVD sales decreased by $11.15m (down 24.6%), with unit sales down 17.5%. This meant $7.4 million less in combined revenue for the week. Blu-ray's market share increased from 34.54% to 44.74%. A big A-lister this week that did more than $1.2 billion in box office globally was this week's top seller. Incredibles 2 was a big seller on Blu-ray and DVD and beat the second placed (and also newly released) Christopher Robin by more than a 4-to-1 margin. The Target exclusive Stranger Things 2 got as high as 7th, while there was room for another new release in the top 10 in the form of BlacKkKlansman, in 9th place. The 4K re-release of Wreck-It Ralph entered the Blu-ray chart at 16th. But largely thanks for 'Incredibles 2', Blu-ray revenue rose above $40 million and weekly Blu-ray market share was once again above 50%. This week's Ultra HD Blu-ray report: Of the previously mentioned new releases, only 'Christopher Robin' was not made available on UHD. 7 titles out of this week's top 10 had UHD editions. Not only was 'Incredibles 2' the best seller of the week, it also topped the market share chart, with a BD sales share of 78.74%. 'Christopher Robin' also did well on Blu-ray, with 70.75%. Both 'Stranger Things 2' and the re-release of 'Wreck-It Ralph' were Blu-ray only releases. As for the UHD releases (in the top 20), 'Stranger Things 2' got a UHD sales share of 22.89%, while 'BlacKkKlansman' got 11.57%. The 'Incredibles 2' managed 8.63%. The stats for the week ending November 11, 2017 are as follows. Some small adjustments to the data posted last year (based on more recent updates) has been made and is shown below. Blu-ray sales increased by $7.76m (up 23.1%), with unit sales up 17.4%. DVD sales decreased by $8.66m (down 18.4%), with unit sales down 18.7%. Blu-ray's market share increased from 41.65% to 51.85%. Blu-ray revenue and weekly market share dropped back slightly, mainly because this week's best selling new release, The Meg, was not a big enough release on its own to prop up the high level of sales thanks to last week's 'Incredibles 2'. In fact, 'Incredibles 2' was still the top selling title this week, with 'The Meg' having to settle for second place. In an even more distant third place was Mile 22, while 5th place was the next new release, Olaf’s Frozen Adventure. Star Trek: Discovery - Season One in 7th place was followed by Alpha. Strangely enough, there were no new releases between 11th and 20th. This week's Ultra HD Blu-ray report: Of the previously mentioned new releases, only 'The Meg' was made available on UHD. 5 titles out of this week's top 10 had UHD editions. Of the new releases in the top 10 this week, 'Star Trek: Discovery - Season One' had the best BD sales share, 55.65%. 'The Meg' just failed to get above the 50% mark which indicates that the Blu-ray version was more popular than the DVD version for the same title. 'The Meg' managed 49.53%. It was just ahead of 'Mile 22', which got 49.24%. 'Olaf’s Frozen Adventure' was a Blu-ray only release. 'Alpha' only managed 36%, which is disappointing for a major blockbuster release. As for the *only* UHD release (in the top 20), 'The Meg' got a UHD sales share of 8.28%. As a rare treat, 'The Meg' was also released on the Blu-ray 3D format. But it only got a BD3D sales share of 1.47%, which perfectly explains why Blu-ray 3D releases are now so rare. The stats for the week ending November 18, 2017 are as follows. Some small adjustments to the data posted last year (based on more recent updates) has been made and is shown below. Blu-ray sales increased by $6.65m (up 26.1%), with unit sales up 21.6%. DVD sales decreased by $7.25m (down 15.4%), with unit sales down 17.1%. This meant $0.6 million less in combined revenue for the week. Blu-ray's market share increased from 35.12% to 44.66%. It's Black Friday week again, where stores, online and off, discount Blu-rays and DVDs and sales go through the roof. BF 2018 is no different, recording the highest Blu-ray and DVD weekly revenue figures for the year, figures that are unlikely to be matched for the rest of the year (although the week before Christmas usually comes close). There are rarely if any notable new releases during the week, and even if there are, they will come nowhere near the top 20. This was the case for Crazy Rich Asians, normally a release that would definitely be in the top 10 or even the top spot itself, but nowhere near the Blu-ray (or Blu-ray + DVD) top 20. Instead, it was the likes of 'Deadpool 2' and 'Jurassic World: Fallen Kingdom' that led the charts, followed by the return to the top 10 for the likes of 'Justice League'. The top 20 reads like a summary of 2018's hits on Blu-ray! And there's a good reason why titles like 'Deadpool 2' were big sellers - the 4K version of the film was going for $9 during Amazon's BF sales, down from the usual $25. The same for 'Jurassic World: Fallen Kingdom', or in 'Jumanji: Welcome to the Jungle' case, a super low $7.96 for the 4K version! Not all of the top sellers had 4K discounted versions, but it's worth noting that every single title in the top 10 this week all had 4K editions available for purchase. So how did BF 2018 compared to previous Black Friday sales? For the first time in a couple of years, we've actually had a rise in Blu-ray sales this Black Friday compared to the previous one, very likely on the fact that many 4K Ultra HD Blu-ray movies were being heavily discounted for the first time since the format's inception - it was a great opportunity for people to "upgrade" their collection. Blu-ray sales rose 8.9% compared to a year ago. DVD sales, on the other hand, continued its steady decline, dropping a massive 20.8% compared to last year (which was down 15.7% compared to the year before). It won't be long before parity is reached, and soon after, Blu-ray becomes the most dominant format during Black Friday sales, which has yet to happen after all these years. Total revenue was still down 9.08%, or $22.05 million, better than the $36 million decline recorded last year. Note that these stats do not include Cyber Monday sales, the stats for which comes next week. This week's Ultra HD Blu-ray report: Amazingly (or predictably), every single title in the top 10 had 4K UHD editions, and many of these 4K editions were heavily discounted during Black Friday for the first time. There were no new releases in the top 20, but the titles that were in the top 10 recorded some pretty impressive UHD sales shares. 'Deadpool 2' managed 12.51%, while 'John Wick Chapter 2' got 19.10%. 'Ant-Man and The Wasp' hit a high of 32.12%, the highest of all titles this week. And we have a fair idea that it was 4K sales that led the good sales results because, if you look below, Blu-ray revenue's increase was bigger than the unit sales increase - meaning the titles that helped with sales were actually more expensive than average - so either boxsets or 4K discs (most likely the latter). The stats for the week ending November 25, 2017 are as follows. Some small adjustments to the data posted last year (based on more recent updates) has been made and is shown below. Blu-ray sales increased by $8.53m (up 8.9%), with unit sales up 3.7%. DVD sales decreased by $30.58m (down 20.8%), with unit sales down 18.5%. This meant $22.05 million less in combined revenue for the week. Blu-ray's market share increased from 39.46% to 47.26%. Welcome to Black Friday Week's little brother, Cyber Monday Week, where you can still get some great bargains on Blu-ray, but it's nowhere near the level on BF. 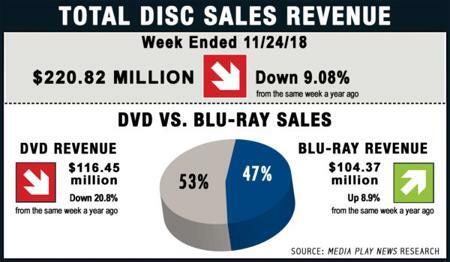 And that's where revenue was too: a pretty big week for Blu-ray, but nowhere near the scale of Black Friday. And as with Black Friday, it's not a week known for new releases, and so we didn't have any in the top 20. As to why Cyber Monday week isn't a huge seller like Black Friday, we can rely on our Amazon Price Index to check the pricing history on selected titles. Take 'Deadpool 2', which was the top seller for Black Friday, and still the second most popular title during Cyber Monday despite its age. For Black Friday, the price of the 4K edition dropped to $9, while it was around $15 for Cyber Monday (and now back to $20). Most of the titles in the top 10 followed a similar pricing pattern. In other words, the discounts on Cyber Monday just weren't big enough to sustain the buying frenzy, and so naturally, Blu-ray revenue dropped significantly. This was especially true for 4K titles, many being discounted for the first time ever. This perhaps explains why Cyber Monday Blu-ray sales were down 2.6% compared to last year's Cyber Monday Week. But because DVD sales dropped even faster, by 26.6%, weekly Blu-ray market share actually rose quite significantly compared to a year ago. Proof that the more expensive 4K discs are selling week is shown further below when, compared to last year, Blu-ray revenue fell 2.6% despite a greater unit sale fall of 6% - fewer units sold for higher prices. Even with heavy discounting, it seems DVDs have had its day and now standard Blu-ray is the new DVD, whereas 4K is the new Blu-ray. This is why we have already started to linking to the 4K edition of any title by default here in our weekly report and analysis - it just seem like the time to do so. This week's Ultra HD Blu-ray report: Once again, every single title in the top 10 had 4K UHD editions. There were again no new releases in the top 20 to analyse, but some 4K titles had impressive UHD BD sales share, with 'Avengers: Infinity War' leading the chart with 22.57% (so more than 1-in-5 buyers chose the 4K edition over all other editions, including standard Blu-ray and DVD). 'Ant-Man and The Wasp' with 22.35% was also impressive, and 'Solo: A Star Wars Story' has been holding firm in the top 5 since its release, this week with 19.28%. It took Blu-ray years to achieve this kind of consistent market share over DVD. The stats for the week ending December 2, 2017 are as follows. Some small adjustments to the data posted last year (based on more recent updates) has been made and is shown below. Blu-ray sales decreased by $1.25m (down 2.6%), with unit sales down 6%. DVD sales decreased by $20.95m (down 26.6%), with unit sales down 23.6%. This meant $22.2 million less in combined revenue for the week. Blu-ray's market share increased from 37.92% to 44.77%. Despite the end of Cyber Monday, Blu-ray sales didn't drop off a cliff as expected, all thanks to the release of an A-list title in the form of Mission: Impossible - Fallout. It was easily the week's top seller, and way ahead of the next new release The Nun, in third place. The Happytime Murders, the next most popular new release, was in 5th place, while you had to go all the way to 16th for the next new release, Westworld: Season Two - The Door. And the re-release of The Lion King on 4K managed to get the title a 20th place finish. God Bless the Broken Road was 19th on the combined Blu-ray and DVD sales chart, but failed to get into the Blu-ray top 20. This week's Ultra HD Blu-ray report: Both 'Mission: Impossible - Fallout' and 'The Nun' were available in UHD format, along with of course the 4K re-release of 'The Lion King'. 9 titles out of this week's top 10 had UHD editions. The stats for the week ending December 9, 2017 are as follows. Some small adjustments to the data posted last year (based on more recent updates) has been made and is shown below. While 'Mission: Impossible - Fallout' was a big movie, it apparently wasn't as big as 'Despicable Me 3', and with DVD sales declining during this holiday sales season compared to the previous one, overall revenue was down by more than $20 million. Blu-ray sales decreased by $1.4m (down 3.2%), with unit sales down 1.9%. DVD sales decreased by $19.29m (down 25.7%), with unit sales down 25.6%. This meant $20.69 million less in combined revenue for the week. Blu-ray's market share increased from 36.83% to 43.17%. We're now into the thick of the holidays shopping period, where sales increase, building up all the way to the end of the year. This is why, despite the lack of an A-list release, Blu-ray and DVD revenue both rose compared to the previous week. That's not to say there weren't new releases. The top selling new release was The Equalizer 2, which was also this week's overall top seller. It sold almost twice as many copies as the second placed Smallfoot. The next new release was 5th, Peppermint. It was then all the way down to 19th for the next new release, Unbroken: Path to Redemption. This week's Ultra HD Blu-ray report: Only 'The Equalizer 2' was made available on 4K Ultra HD, out of the previously mentioned new releases. 8 titles out of this week's top 10 had UHD editions. It was 'Unbroken: Path to Redemption' that had the highest BD sales share, with 78.57%. 'The Equalizer 2' managed to get 60.48%, while 'Peppermint' got 55.66%. 'Smallfoot' failed to get above 50%, with a BD sales share of 46%. A rare treat in that 'Smallfoot' was also made available on Blu-ray 3D, but with a BD3D sales share of just 0.064% (in other words, only 6.4 Blu-ray 3D copies were sold for every 10,000 copies of all formats sold), don't expect too many more 3D releases in the future. 'The Equalizer 2' managed to grab a 4K UHD sales share of 8.83%. The stats for the week ending December 16, 2017 are as follows. Some small adjustments to the data posted last year (based on more recent updates) has been made and is shown below. This year's holiday sales period is off to a slower start than last year's, especially with DVD sales down by almost 28%! Blu-ray sales decreased by $5.24m (down 9.3%), with unit sales down 4.0%. DVD sales decreased by $25.39m (down 27.8%), with unit sales down 26.5%. This meant $30.63 million less in combined revenue for the week. Blu-ray's market share increased from 38.17% to 43.67%. The Christmas shopping period combined with the release of A-list title Venom helped push Blu-ray (and DVD) revenue to one of 2018's high points. While 'Venom' was the clear top seller, the top 3 were all new releases, including The Predator in 2nd place, and The House With a Clock in Its Walls in 3rd. Then it was all the way down to 18th for the next new release, A Simple Favor. Another notable release for the week was the 25th Anniversary edition of Schindler's List, including the milestone film's first ever foray into 4K. It seems the new edition didn't sell enough copies to make it to either the combined or the Blu-ray only charts, though. This week's Ultra HD Blu-ray report: All of the just mentioned titles had UHD editions. 9 titles out of this week's top 10 had UHD editions. 'The Predator' had the highest BD sales share out of the previously mentioned new releases in the top 20, with 70.21%, followed by 'Venom' with 68.23%. The ranking for these title's 4K UHD releases were almost the same, with 'The Predator' the most popular on UHD with a UHD sales share of 14.86%, followed by 'Venom' at 14.09%. 'A Simple Favor' got 8.55%, while 'The House With a Clock in Its Walls' managed 7.14%. The stats for the week ending December 23, 2017 are as follows. Some small adjustments to the data posted last year (based on more recent updates) has been made and is shown below. The holiday period comparison continues, and this week, Blu-ray revenue was up (3.9%) compared to the same week last year, but DVD revenue was way down (-29.9%). Blu-ray sales increased by $2.98m (up 3.9%), with unit sales up 2.8%. DVD sales decreased by $35.92m (down 29.9%), with unit sales down 31.7%. This meant $32.94 million less in combined revenue for the week. Blu-ray's market share increased from 38.88% to 48.52%. The post Christmas period is upon us, and while there are still sales to be had, there aren't any new releases this week for the good reason that people just won't pay attention to them. In fact, the top 10 list this week has a distinctly familiar look compared to the previous week - the titles are exactly the same, and even the ordering is fairly similar. But with no new releases, what do we do this week? We of course compared this post-Christmas period with the last one, to see how Blu-ray and DVD is doing. And the conclusion is that Blu-ray is doing well, but DVD is definitely not. Blu-ray sales were up 36.8% (from rising unit sales of 39.5%), while DVD sales were down 4.2% (unit sales down 8.1%) compared to the same week last year. This week's Ultra HD Blu-ray report: 9 titles out of this week's top 10 had UHD editions. No new releases, so nothing much to look at here, but it's worth noting that this week's highest ranked title in terms of UHD sales share was 'Avengers: Infinity War', with a UHD sales share of 21.79%. This means more than 1 in every 5 copies of this movie being sold (the total includes standard Blu-ray, as well as DVD sales) was for an edition with the UHD edition as part of it. Considering there's usually only a $2-4 difference between the standard Blu-ray and UHD + Blu-ray edition, it's a small premium to spend to ensure some degree of future proofing. It sure beats having to re-buy the movie again on 4K in the future! The stats for the week ending December 30, 2017 are as follows. Some small adjustments to the data posted last year (based on more recent updates) has been made and is shown below. Blu-ray sales increased by $11.47m (up 36.8%), with unit sales up 39.5%. DVD sales decreased by $2.11m (down 4.2%), with unit sales down 8.1%. This meant $9.36 million more in combined revenue for the week. Blu-ray's market share increased from 38.29% to 46.98%. So we're at the start of a new year, and as with most starts, it's a slow one. Everyone is still in holidays mode, including distributors, retailers and I guess consumers too, so it's another very light week in terms of new releases. What we did have, however, were titles that weren't popular enough to steal the number one spot from last week's top seller, 'Venom'. Night School came closest, but it only sold around half as many copies as 'Venom', while Bad Times at the El Royale was not too far away in 3rd place. And that was it for new releases in the top 20. This week's Ultra HD Blu-ray report: Both of the new releases this week were available on UHD. 9 titles out of this week's top 10 had UHD editions. 'Bad Times at the El Royale' had the best BD sales share out of the two new releases, with 70.32%. 'Night School' had to settle for 49.94%. The order was preserved for the UHD sales share, with 'Bad Times' getting 17.77% compared to the 4% for 'Night School'. The stats for the week ending January 6, 2018 are as follows. Some small adjustments to the data posted last year (based on more recent updates) has been made and is shown below. Blu-ray sales increased by $4.76m (up 21.7%), with unit sales up 26.0%. DVD sales decreased by $6.02m (down 15.0%), with unit sales down 15.3%. This meant $1.26 million less in combined revenue for the week. Blu-ray's market share increased from 35.30% to 43.86%. With 2018 now done, keep an eye out for our annual Blu-ray: The State of Play annual report on how well (or badly) Blu-ray did during the year just gone. The January lull is still with us, and both the quantity and quality (in terms of revenue) of new releases are somewhat lacking. This is why you had to go all the way down to 7th place for the first new release, Hell Fest. The next new release, Dragon Ball Super: Part 6, wasn't too far behind in 8th place. The next new release, which is also the last one in the top 20, was Mid90s. This week's Ultra HD Blu-ray report: Only 'Hell Fest' was available on UHD, out of the previously mentioned 3 new releases. 9 titles out of this week's top 10 had UHD editions. 'Dragon Ball Super: Part 6' had the best BD sales share out of all titles this week, with 76.57%. 'Mid90s' managed 63.05%, while 'Hell Fest' got 51.41%. The UHD edition of 'Hell Fest' got a UHD sales share of 9.75%. The stats for the week ending January 13, 2018 are as follows. Some small adjustments to the data posted last year (based on more recent updates) has been made and is shown below. This time last year, the hit blockbuster 'It' was released on Blu-ray, and as a result, there was no way this week could compete. Blu-ray sales decreased by $7.68m (down 27.6%), with unit sales down 19.3%. DVD sales decreased by $12.94m (down 31.4%), with unit sales down 27.8%. This meant $20.62 million less in combined revenue for the week. Blu-ray's market share increased from 40.30% to 41.61%. Another quiet week in terms of revenue, but there are a few more new releases now that the new year is starting to wake up. The 2018 version of Halloween was the week's top seller, selling nearly 3 times as many copies as the next title on the chart, another new release, Goosebumps 2. Not too far behind in 3rd place was the Blu-ray only release Once Upon a Deadpool, the Christmas/Family Friendly/Fred Savage version of Deadpool 2 (if none of this makes sense to you, check out this trailer). Then it was all the way down to 11th for the next new release, The Old Man & the Gun. On the combined Blu-ray and DVD charts, Speed Kills got to as high as 14th place, but failed to sell enough copies on Blu-ray to get into the Blu-ray top 20. This week's Ultra HD Blu-ray report: Both of the top 2 releases, 'Halloween' and 'Goosebumps 2' were available on UHD. 8 titles out of this week's top 10 had UHD editions. For BD sales share, 'Halloween' had the best of not just the new releases, but all titles, with 69.23%. 'Goosebumps 2' got 53.37%, while 'The Old Man & the Gun' got 42%. 'Speed Kills' got 32%. The stats for the week ending January 20, 2018 are as follows. Some small adjustments to the data posted last year (based on more recent updates) have been made and are shown below. Blu-ray sales decreased by $2.71m (down 10.4%), with unit sales down 0.2%. DVD sales decreased by $9.02m (down 23.7%), with unit sales down 21.9%. This meant $11.73 million less in combined revenue for the week. Blu-ray's market share increased from 40.63% to 44.56%.